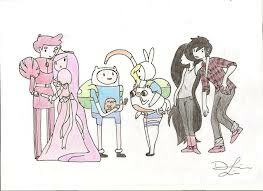 My drawing. . Wallpaper and background images in the Adventure Time With Finn and Jake club tagged: marceline finn princess bubblegum fionna marshal lee jake cake prince gumbal. *facepalm* THIS IS NOT YOUR DRAWING!